Paul Tudor Jones says the Goldman Sachs JUST fund that tracks an index of social impact securities curated by the nonprofit JUST Capital is tracking the performance of the S&P 500. The famed hedge fund investor also says a number of new companies have made their way into the ranking, which was led by Microsoft. "There was a poll recently conducted: 51 percent of millennials between 18 and 29 [years of age] are opposed to capitalism. You're going to be, 20 years from now, doing this from Havana unless we change the way that capitalism works right now because we're leaving too many behind," Tudor Jones said in a CNBC interview. Paul Tudor Jones, founder and CIO of Just Capital. 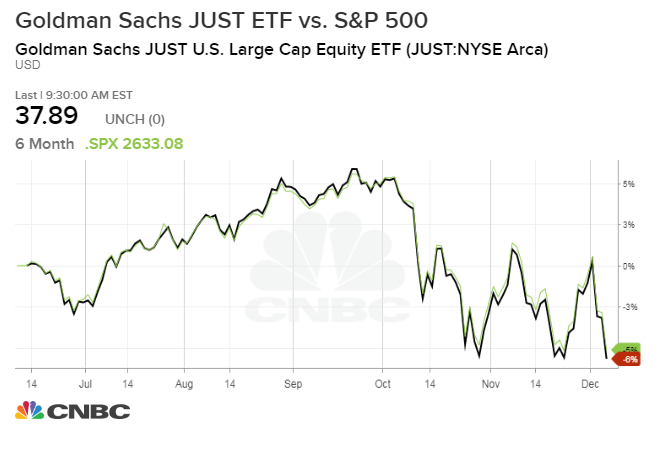 Paul Tudor Jones said Monday that a new exchange-traded fund using JUST Capital's Ranking of companies doing right by the American people is tracking the performance of the S&P 500 since its launch in June. Tudor Jones said in an interview with CNBC's Andrew Ross Sorkin that the companies are sorted based on several factors, including worker pay disparity, customer relations and whether the firm produces socially beneficial products. Historical analysis over the last two years through June 1 shows the fund would have outperformed the Russell 1000. The billionaire investor said that Microsoft topped the most recent ranking thanks to its attention to the pay gap between its male and female workers. The software giant has 100 percent compliance on pay equity, Tudor Jones said, meaning that the company conducts surveys to ensure that women are paid just as much as men are. "There was a poll recently conducted: 51 percent of millennials between 18 and 29 [years of age] are opposed to capitalism. You're going to be, 20 years from now, doing this from Havana unless we change the way that capitalism works right now because we're leaving too many behind," Tudor Jones told Sorkin. "In the past 40 years we've had an 80 percent increase in worker productivity, but they've only shared in 10 percent of that." The JUST fund seeks to track the JUST U.S. Large Cap Diversified Index (JULCD), constructed and managed by JUST Capital, a nonprofit co-founded in 2013 by Tudor Jones. The famed hedge fund investor also said a number of new companies have made their way into the JUST Capital Rankings, which tracks a selection of Russell 1000 companies based on how just each performs on the priorities of the American public. "If you don't have really well incentivized, smart, engaged workers, you're not going to have a product and you're not going to have customers," Tudor Jones said Monday on "Squawk Box." "The reason we started Just Capital was because we want to make capitalism work for all. We're trying, through the private sector ... to change the most important thing in all of our lives — which is our work — in a way that's going to give us a society that's more sustainable." The Goldman Sachs JUST fund is down about 5 percent since it launched in June. FactSet data show the S&P 500 down 5.1 percent since June 13, while the JUST fund is down 5.6 percent. Jones, who rarely talks to the press, has a net worth of $4.5 billion, according to Forbes. Tudor Jones in 1988 founded the Robin Hood Foundation, a charity that counts many Wall Street leaders as board members and is focused on fighting poverty in New York City.